I don't know about you, but I'm one of those people who prefers to move on after a holiday is over. Don't get me wrong -- I'm a huge fan of, well, ALL of them, but when one is done, I'm onto the next one. The decorations come down and new ones go up ASAP. I get it from my mom who has been known to have the entire house devoid of Christmas decor by the end of Christmas Day. No lie. 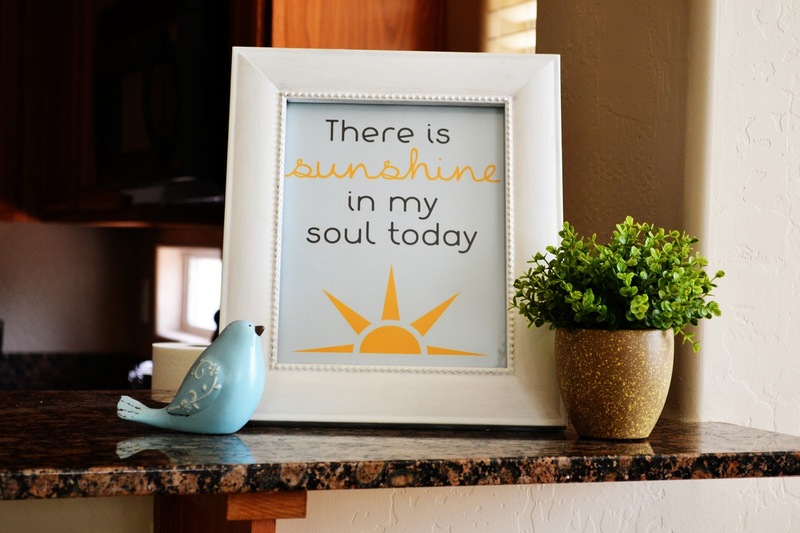 There isn't a major holiday between now and Independence Day, so I decided to make a generic spring/summer printable based on the text from one of my favorite hymns, "There Is Sunshine in My Soul Today." This is just a downright happy song with such adorable lyrics. Also, we're lucky to get ample amounts of sunshine in Arizona so I feel like I'm never lacking in that department. This printable is super-versatile and should get you through until September at least. Hurray for efficiency! If you're like me and Easter is now officially in the past, download and print your sunshine printable today. I've included both a PDF and a JPEG file (in case you'd rather send it to Costco than print it at home). Links are below, and as usual, it's an 8 x 10. Enjoy! That is so cute! Love it! And decorations down by the end of Christmas day- that is crazy! Where did you get that cute little plant? While I'm asking...where'd you get the cute little bird? That's exactly the color I'm trying to incorporate in my kitchen! The plant I found at Ross last week for a measly 5 buckaroos. Couldn't believe it! It was the only one left -- I wanted a few more. The bird was at Hobby Lobby about a month ago. It was 30% off! I feel like I found a kindred soul when it comes to holiday decorations coming down once it's over. Haha! That aside, I love using printables for décor too because it's cheaper to print rather than buying new decorations. I have a library of printables to pick from and print once a month, so I can save on ink and not have my printer die on me.